Emma Kunz was an artist and healer who worked with a pendulum to create abstract geometric drawing on graph paper and discovered healing properties of rock minerals in her local area. Some chemists today still stock Aeon A healing rock powder, with her line drawings used on the packaging design. Kunz, aka ‘Penta,’ devised quite independent telepathic interactions and quasi-performance. 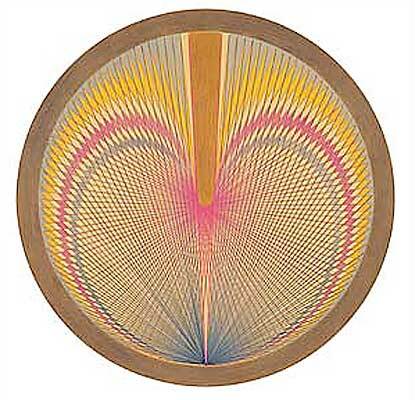 Kunz worked as a psychic medium, as did modernist artist Frantisek Kupka and Outsider artist Augustin Lesage. Born in Switzerland 1892, she experimented with telepathy in many hundreds of mandala drawings created as part of healing therapy. She started practising telepathy at the age of 18, along with her healing and prophesying. Kunz’s work with telepathy is discussed by Catherin de Zegher in a book on drawing called 3 x Abstraction, which also looks at the art-and-healing-oeuvre of a number of female artists working with telepathy, abstraction, performance and/or healing such as Hilma af Klint, Bracha Lichtenberg Ettinger and Lygia Clark. Like Duchamp, Kunz and Klint worked with telepathy at the time of ‘the invention of telepathy’ – as the term telepathy entered currency in English society of Psychical Research in the late nineteenth century – and these artists are female inventors of abstraction, arguably preceding many of the more famous, art marketed and art historically canonized male artists working with telepathy. In 1997 Kunz was represented alongside the work of Joseph Beuys and Bruce Nauman in Harald Szeeman’s guest curatorship of the Lyon Biennale d’art contemporain L’autre331. L’autre, translated as ‘the other,’ showed documentation of Kunz’s work as a medium alongside the complex geometric drawings that acted as maps for her healing work. Kunz, along with artists such as Hiller, Kupka, Lesage, Ettinger, Joseph Beuys and Lygia Clark, reconstructed the cosmic artist healer (who is feminine, if not female) as both doctor and patient.